Researcher Dr Claire Eccleston from the University of Tasmania Wicking Dementia Research and Education Centre has been making good use of the $50,000 Plants Management Australia - Whetman Pinks Project Grant awarded by the Dementia Australia Research Foundation in 2016. Dr Eccleston is focusing on creating dementia-friendly communities by determining the current attitudes and knowledge about dementia within a community. This information can be used to enable targeted education to businesses, councils, schools and service organisations. It’s hoped this knowledge will, in turn, support those organisations and individuals to better understand dementia, its impact, and how they can contribute to enhancing quality of life for people living with dementia. Dr Eccleston anticipates to directly address the deficit of information about dementia knowledge in communities by using the Dementia Knowledge Assessment Survey (DKAS), a new tool developed by Wicking Dementia Research and Education Centre (WDREC). The project has two main components: a quantitative survey followed by a series of focus groups targeting a wide range of people from different Tasmanian communities. “When developing dementia-friendly communities, dementia is everybody’s business. The consumers in this project are community members who will help form dementia-friendly communities, and will be living with, caring for and interacting with people with dementia,” she said. Dr Eccleston says the grant provides vital funding that supports the project team in surveying people from communities across regional and rural Tasmania, as well as parts of urban Tasmania that are less commonly reached. 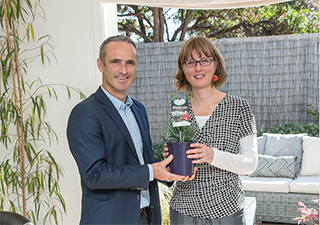 Plants Management Australia (PMA) Managing Director Chris Sargent said he is pleased that PMA’s continued commitment to the Dementia Australia Research Foundation, which comes through donating a percentage of the profits from the Dianthus ‘Memories’ plants, has resulted in the funding of Claire’s research. “Dr Eccleston’s research stood out to us as she is trying to make a difference in communities for everyday people. Her research focusing on making the lives of those affected by dementia, both directly and indirectly, easier through education and understanding, can and hopefully will reach large and small communities across Australia,” he said.